Surrounded by 3.000-m high summits, your stay at Peyragudes's ski resort will be full of both action and relax. Our hospitality and the friendly resort's atmosphere make the difference. Make the most of your time at the ski area and the promenade area, exploring snow-covered paths or even treating yourself to a relaxing bath. You won't regret it! The ski area of Peyragudes spans two French departments; on one side, the Haute-Garonne department and on the other side the Hautes-Pyrénées department. It is a member of the N'PY group along with six other ski resorts and three Nordic ski areas. The Peyragudes ski area is located in an exceptionnal environment with an ideal east/west orientation which allows skiers to ski all day long, from one side of the mountain to the other in the sunshine. 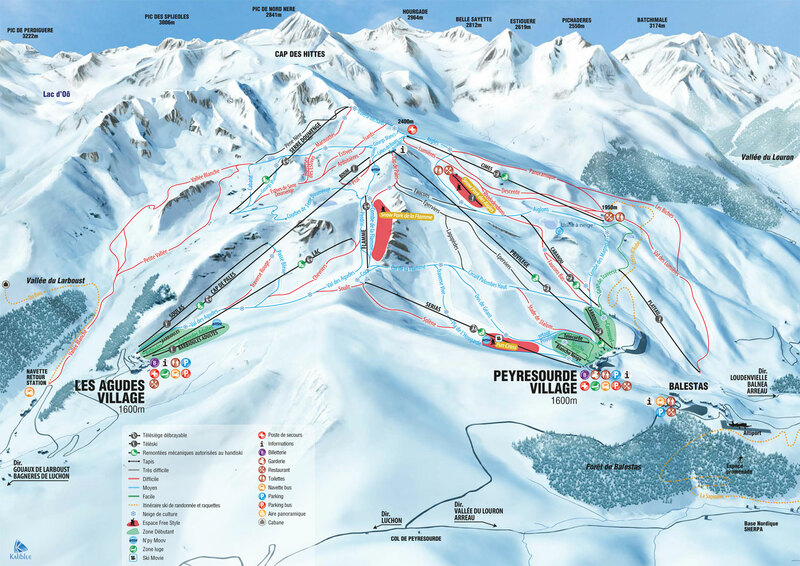 Peyragudes ski resort came to be after a fusion of the two villages of Les Agudes and Peyresourde in 1988. These two villages each at the foot of the piste were united and became proud resorts in the ski area of Peyragudes. The peaceful location of the villages remains just as magical today as do the spectacular views and a feeling of space and serenity. You could say that Peyragudes is the "Zen" ski resort!